Here’s a recipe for a Beef on Weck sandwich, courtesy of Adam Richman. 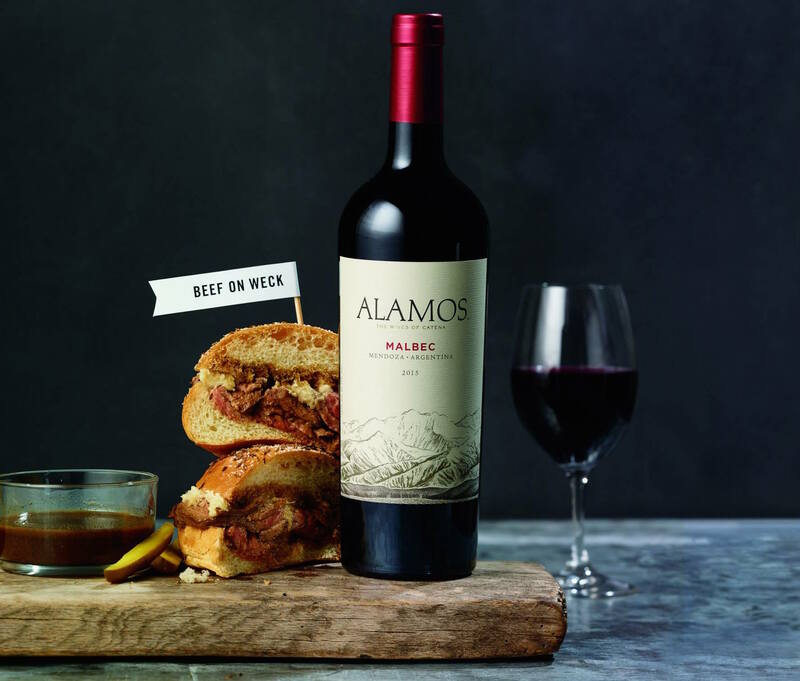 This was one of the regionally-inspired sandwich recipes he created in collaboration with Alamos Wines and pairs nicely with Malbec. Adam’s Buffalo-inspired is made with roasted beef that has been seasoned with olive oil, salt and pepper. The beef is then sliced thin, covered in it’s own juice from roasting, topped with horseradish and served on a Kummelweck-style roll. Slice open the rolls. Stack the beef on the bottom bun and top with a dollop of horseradish. Dip the top bun in the au jus so that it is just a little bit soggy. Close the sandwich and serve with a side of au jus for dipping and a pickle spear for garnish. Combine salt and whole caraway seeds. Heat ½ cup of water to a boil on the stove in a small saucepan. Use a measuring cup to dissolve the cornstarch in about ½ cup of water; add the mixture to the boiled water on the stove. Let thicken until it coats a spoon. Cool and store in refrigerator. Preheat oven to 325°F. Place rolls on a baking sheet. Brush tops of rolls with cornstarch solution and sprinkle with seed mixture. Place in oven for 4 minutes or until the topping dries. Preheat oven to 350°F. Rub steak with pepper, salt and garlic salt. Heat a large cast-iron pan over high heat. Add olive oil and then meat. Sear steak on both sides in a pan with a high rim until browned and crust forms, about 2½ minutes on each side. Put the steak in the preheated oven for 2-4 minutes, until the internal temperature is 140-145°F. Remove from oven and let rest for about 5-7 minutes before slicing. Reserve pan. To make the au jus, deglaze the pan with the beef stock, minced garlic and additional salt and pepper. Keep the liquid simmering and drop the sliced beef in the jus for about 10-15 seconds per slice.